The global military vetronics market has been foreseen to offer the best of opportunities for vendors in Asia Pacific and Rest of the World as a result of a multiplying outlay to innovate military vehicles. The Vehicle Integration for C4ISR/EW Interoperability (VICTORY) initiative could provide a good ground for players to offer products with enhanced operational applicability and efficiency, thereby increasing the competition in the market. Curtiss-Wright Corporation, for instance, designed a VICTORY standards compliant system named DuraDBH-672 Digital Beachhead to serve ground and airborne military vehicles with size, weight, power, and cost (SWAP-C) optimized commercial off-the-shelf (COTS) solutions. SAAB A.B., General Dynamics Corporation, Rheinmetall A.G., and Oshkosh Corporation are some of the other superior players in the market. 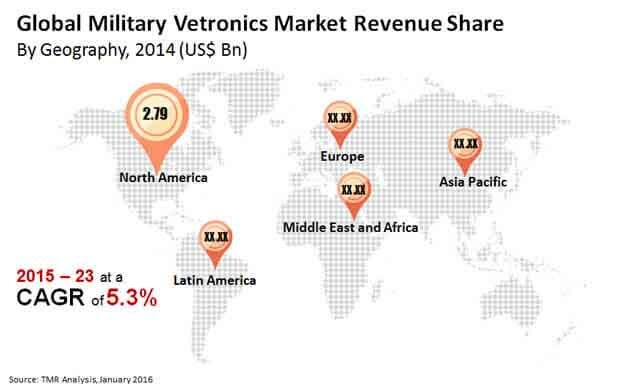 As per the statistics provided in a report by Transparency Market Research (TMR), the world military vetronics market has been prophesied to reach US$10.71 bn by 2023 at a CAGR of 5.3% from 2015. By system, the power systems market could showcase dominance by attaining a valuation of US$3.45 bn by the end of the forecast period. The need for integrating innovative systems in military vehicles to cater to the requirements of remote controlled and autonomous operations has been anticipated to support the growth of power systems. North America could attract a royal share of just above 40.0% by 2023 due to the inflating research and development investment in modern combat vehicles. The worldwide military vetronics market has been prognosticated to benefit from the demand for embedded technology growing swiftly due to the rising trend of reducing the SWAP-C of vehicle electronics. This could be on account of the swelling demand for robust, high efficiency, and compact military vehicles. The Versa Module Europa bus (VMEbus) International Trade Association (VITA) standards have also been anticipated to promote the trend of reduced SWAP-C specifications. Another trend of procuring advanced military vehicles with present-day vetronics and revamping bygone vehicle fleets could be a solid platform for vendors to penetrate into the global military vetronics market. The analysts foretell the worldwide demand for rugged vetronics to increase on the back of the frequenting application of network-centric warfare that involves the collection of critical situational and real-time data. Advanced military requirements pertaining to the employment of big data and the Internet of things (IoT) could be a strong driving force for the world military vetronics market to grow significantly. The researchers have envisaged the open architectural designs of military vetronics to raise issues related to on-vehicle network security and capacity. Moreover, due to the SWAP-C reduction initiatives, a number of subsystems have been integrated into a single one. This increases the temperature inside the vehicles, which is not ideal for both the personnel and systems therein. The global military vetronics market could also suffer a slowdown owing to the focus on demilitarization in North America, particularly in the U.S. post the Iraq and Afghanistan wars, and Europe. Contrastingly, the SWAP-C reduction initiatives have been marked as a key factor forwarding the demand for military vetronics to enable 360-degree situational awareness, integration of multiple displays, and reduction in the acquisition cost of vehicles, besides C4ISR capability enhancement and improvement in operational redundancy. The adoption of new developmental technologies in the wake of the surging application of military modernization and network-centric military operations has also been envisioned to weaken the effect of deterrents in the global military vetronics market.